Flowing Park is located on top of the southwest side of the Grand Mesa overlooking Grand Junction, Delta and Cedaredge, Colorado. The Flowing Park Loop trail begins along the Indian Point trail, about 2.5 miles from Flowing Park Reservoir, and circles around the rim of the mesa to Indian Point where you can follow the Indian Point trail back to your beginning. The trail can be access from the parking area at Flowing Park Reservoir or from the Mesa Top trailhead along Highway 65. The views along the rim of the mesa are nothing short of spectacular. The trail passes through many groves of aspen and pine trees. In late spring and for most of the summer the area is lush with grass, wildflowers and a variety of berries including raspberries, salmon berries and Christmas (or Oregon) grapes. The elevation varies around 200 feet in a gradual enough manner that the trail has a feeling of being mostly flat. 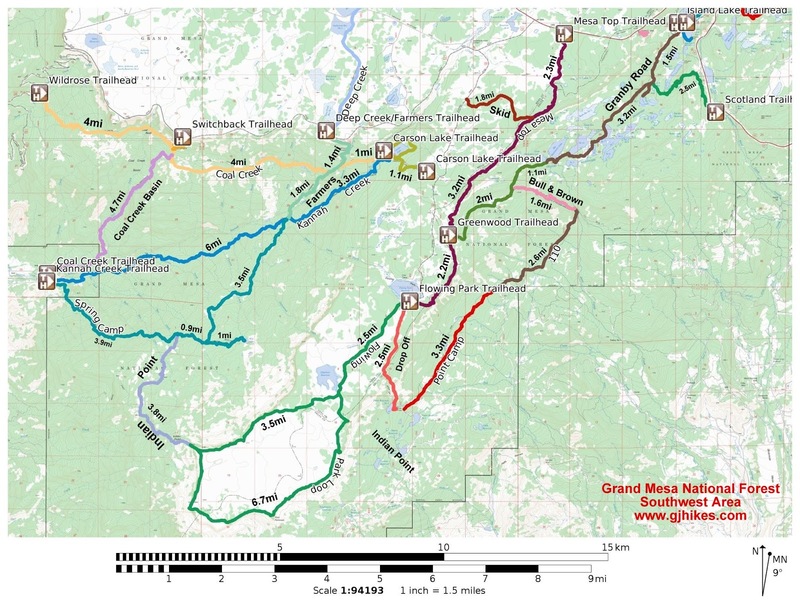 The most notable change in grade is in the area within the first mile of Flowing Park Reservoir. All though the length of the hike is 15 miles it is still some of the easiest and most pleasant hiking in the area. The trail is well marked and easy to follow. There are a few places where game and livestock trails cross the main route but if you keep in mind that you are mostly following the rim around the mesa you can rule out any trails that lead in another direction. 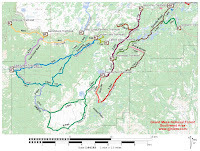 A good map is nice to have but other than the Google Map on this page I haven't seen any that show the Flowing Park Loop trail. The map in my GPS only shows the Indian Point trail. Of course, that is a big reason that I am making these posts is to take some of the unknown out of the hikes so a person can better prepare for them. The trail follows a gravel road for the first 3/4 mile. There is a little elevation gain as it leaves the area around the lake but it levels off within a quarter mile. At about 3/4 of a mile there is a sign marking the beginning of the Indian Point trail. The trail leaves the road and heads off in the direction of Chambers Reservoir. There is a small grove of pine trees at about 1.6 miles where the trail leaves the left side of the road. You can keep following the road, which you can tell from the tracks is what most of the bikes do, but following the trail instead of the road cuts off about a quarter mile. The road makes a hard left turn close to Chambers Reservoir and then the trail and road rejoin each other again. The Flowing Park Loop trail begins at about 2.5 miles. I had been hiking about 45 minutes when I reached this point. I had stopped a few times to take some pictures. After following the loop trail for about a half mile the trail comes to a fence with a gate. The gate is only about 50 feet or so from the edge of the mesa so it is well worth it to walk over and take a look. The Grandby Reservoirs can be seen in the thickly forested area just past the field of basalt boulders. The trail moves in from the rim of the mesa for a half mile or so and then drops down into a seasonal drainage where a waterfall, at times, spills over the edge. I left the trail again at this point to have another look down. You can see in the above picture one of the forested areas that the trail passes through. A good bit of time for the next few miles is spent passing through groves of aspen trees. The picture above is looking back at Point Peninsula. The point juts out from the mesa towards Delta. You could probably go down that way if you didn't mind spending a couple of days climbing over boulders. Knowing that Douglas Fir can grow to over 200 feet in height you can use them for a ruler to get an idea of just how high the cliffs are in places. Some cliffs have a shear face of over 500 feet. Most of the trail is well back from the edge so you have to venture over a ways if you want to look directly below. I could see just fine from the trail without having to do that. The falcons almost seem sociable. Coming around the west side of the mesa you can see for over a mile down towards Indian Point. It is this section of the trail that drops just below 10,000 feet in a few places. The Flowing Park Loop trail rejoins the Indian Point trail right at 9 miles into the hike. That should put the actual distance of the Flowing Park Loop trail at 6.5 miles. From where the trails meet it is a couple hundred feet over to Indian Point. If you feel up to it you can hike on over the side of the mesa for the first switchback or so and check out the area below the rim. It is well worth the little bit of extra effort. Here is a link for a post that describes the trail all the way down to the City Intake trailhead. Heading back towards the trailhead on the Indian Point trail there are a couple of places where you can get a good look at the rim above the Kannah Creek Basin. The one spot of water that sits in the upper area of the basin, surrounded by pine trees and boulders is Blue Lake. You can hike there from the City Intake trailhead along the Spring Camp trail. Keep your eye out for bears because there are a lot of them. There are a couple of thickly wooded pine groves that are so dark that they are almost spooky to enter until your eyes adjust to the light. The camera always makes them look a lot brighter than they are. They add some nice variety to the hike. As the trail gets nearer to the road again there is a gradual up-slope of about 100 feet before dropping back down into the area around Flowing Park Reservoir. The hike took me about 6 1/2 hours to complete. I spent 20-30 minutes of that visiting with a bow hunter and a couple that I met and another 30-60 minutes doing a little trail maintenance clearing rocks and tree branches from the trail. That is probably a good average time though. Someone on a bike is probably going to complete their ride in less than half that time. I went through 120 ounces of water, 60 ounces of Gatorade, a bagel, 2 large energy bars and a protein bar. The slideshow below should give you a pretty good idea of what the trail is like. There are a few rocky sections that will probably slow a bike down just a bit but all in all it's not too bad. If you would like to see it for yourself then all you have to do is 'Take a hike'.